Detroit’s Bedrock today broke ground on its 1.4-million-square-foot Monroe Blocks project, which will be located at the corner of Monroe Street and Campus Martius in downtown Detroit. The project will include the first high-rise office tower to be built downtown in a generation and more than an acre of open space. The groundbreaking comes one year after beginning construction on what will be Michigan’s tallest building on the former site of the JL Hudson’s department store. The development is slated to be completed in 2022. The historic First National Building and the Chase Tower, also known as The Qube, both designed by famed Detroit architect Albert Kahn, face the park. Detroit’s Neumann/Smith Architecture is working with Danish architecture firm Schmidt Hammer Lassen to design the project. The plan reintroduces historic alleyways and public access points while prioritizing the public realm outside and in each structure’s ground floor. The project is the first in the U.S. for Schmidt, Hammer Lassen. The design was guided by three principals: connecting the downtown districts through urban and landscape design strategies, restoring a variety and density of uses to the heart of downtown with iconic office and residential space, and creating new open spaces of retail, food, and entertainment. 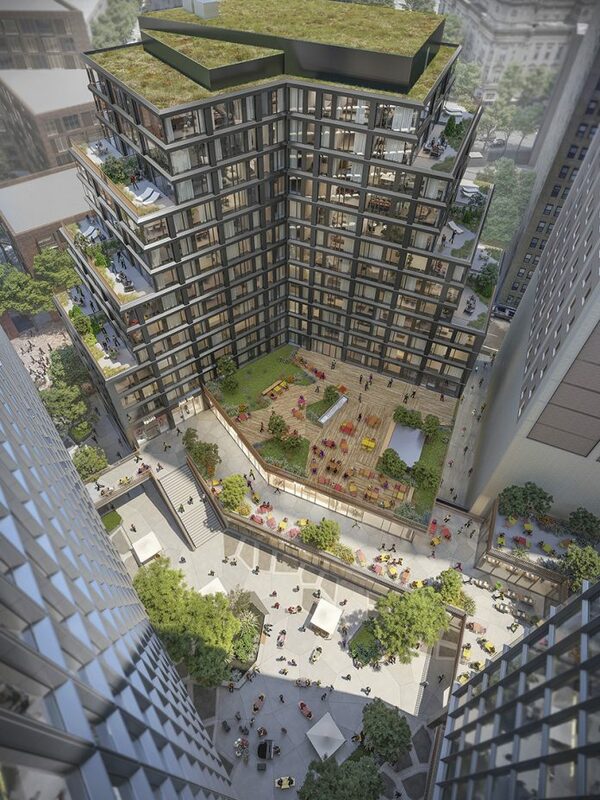 Block A of the project, which is located at Campus Martius and Monroe Street, is about two-thirds of the project and will include a 35-story glass and terra cotta office tower offering large floor plans, tall ceilings, and access to sunlight. It is the city’s first WELL Certified building, meeting requirements to light, air, water, fitness, nourishment, and more. Buildings on Block A are seeking LEED sustainability certification. Block A also will contain a 17-story, 148-unit residential building and a total of 66,000 square feet of retail space designed to attract shops and restaurants. Block B is located at Monroe and Randolph Streets. It will be largely residential, and designs are evolving. Monroe Blocks is expected to offer a total of 847,000 square feet of office space, an estimated 482 residential units, and 117,000 square feet of retail space. The two blocks are cut by a stretch of Farmer Street that will be closed to vehicles beginning Dec. 17 and converted into a pedestrian-only open space. There will also be a courtyard at the center of the development. Bedrock announced four transformational projects that will add more than 3.4 million square feet of office, residential, retail, and open space to Detroit’s Central Business District. The projects represent $2.1 billion in investment and will create up to 24,000 construction and permanent jobs. The other projects include the Hudson’s Site project, the restoration of the historic Book Building and Tower, and a 310,000-square-foot addition to One Campus Martius. Monroe Blocks is one of the largest of the developments. Turner Construction Company is general contractor for the project and predicts that Monroe Blocks alone could require more than 11,000 construction professionals to complete. Bedrock and the Quicken Loans Community Fund are working to prepare the future Detroit workforce for upcoming construction and development jobs. The companies were lead investors in Duggan’s effort to revitalize Breithaupt and Randolph Career and Technical schools to provide an education that expands career options. Bedrock, Barton Malow, and Turner Construction Co. hosted a career expo at Cobo Center where more than 3,000 job seekers learned about trades, met union apprenticeship school directors, and networked with contractors. The two blocks along Monroe Street that make up the development were Detroit’s first theater district and were lined with Italianate stone and brick buildings built between 1852 and 1911. The site was razed in 1990 with the exception of the National Theater, which was designed by Albert Kahn and opened as a vaudeville house in 1911. The theatre hosted a series of acts after vaudeville went out of fashion and closed in the 1970s. It remained vacant and open to the elements for 40 years, incurring irreparable damage. Bedrock plans to retain the façade of the National Theatre and incorporate the terracotta archway into the development. The façade will be disassembled, cataloged, and relocated to span the pedestrian walk. Bedrock is a full-service real-estate firm specializing in acquiring, developing, leasing, financing, and managing commercial and residential buildings. It was founded in 2011 and has since invested and committed more than $5.6 billion to acquiring and developing more than 100 properties with its partners. Its new construction of ground-up developments in downtown Detroit and Cleveland total more than 18 million square feet.